Our 34 week appointment was yesterday. As usual, it was a routine visit. 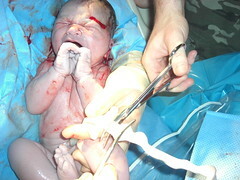 When the doctor measured my fundal height, he said that the baby is at 35 centimeters and he should be around 34. Apparently I'm growing a mutant giant baby! At our next visit, if he is still larger than expected, we'll do another sonogram to get a better idea of his size. Personally, I want a look at that noggin' of his, because if its as big as daddy's, I may opt to be knocked out completely...j/k. Hopefully baby comes a little early, so I don't end up with a linebacker in there. If that is the case, the doc said they probably wouldn't let me go past my due date. My appointments are every two weeks now and next week they start (how do I put this politely) checking on my progress. 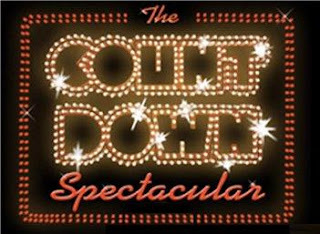 We're in the home stretch! The eviction notice has been put on the uterus and baby has less than 40 days to pack up his things and make his way into the world. Today marks the 50 day countdown to Shock Jr's due date. I swear it was just yesterday that I mentioned it was 100 days away, but wow...time flies when you're having fun. Yes, pregnancy is fun. There are a few annoyances in the 3rd trimester, but nothing a few Tums and putting my feet up won't fix. My attitude may change in a few weeks, but so far everything is pretty manageable. Yesterday was my work baby shower, hosted by the fabulous Mrs. Posey. I will post all about it when I get my hands on the pictures that were taken. I'll just say it was amazing and I felt very loved and pampered. I wanted to add animals closer to the ground so baby Shock would be able to touch and explore when he starts crawling around his room. So that does it for all the animals. I still need to add some grass around the giraffe. Once I do that and clean up the room, daddy is going to videotape the room and post it online. I finished the second monkey tonight. I can officially put the ladder away....phew. I've finished all the animals that I sketched on Saturday, but now I'm on a roll and plan to add a few more critters. I'll get those sketched tonight. Who knows...I could be completely finished this weekend if I keep up this pace. 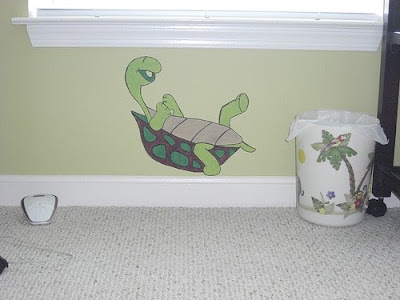 This is the wall with the crib: Baby-daddy is going to video tape the nursery once I'm completely done so you can get an idea of what it looks like. Mr. 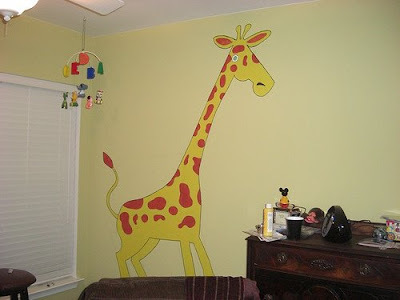 Giraffe will be hanging out behind the glider in the nursery. I need to add some tall grass because right now, he's floating a little bit. I started when I got home from work yesterday and then picked back up after a little dinner and Family Guy. Just call me butter baby, cuz I'm on a roll! That's right...only 9 weeks left to go! Our 31 week appointment was today. All of my previous blood tests came back in tip-top shape and we had a short and sweet appointment. My doctor said as long as I keep behaving (whatever that means), I won't need any additional blood work. He also OK'd me to go on a day-trip to NYC for baby-daddy's birthday. After that, I'm stuck in Fairfax until D-day. Luckily we have a few concerts and some baby classes to keep us busy and distracted. Finals ended last week and this means I could finally start my project in the nursery. 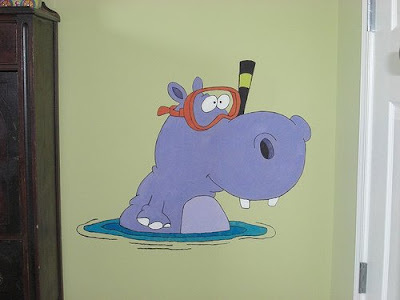 I am painting some animals on the walls to go with the animal themed room. I'm not doing an entire jungle mural or anything like that, I'm going with more cartoon looking animals. On Saturday, I did all the sketching on the walls and stayed up until after midnight painting the birds over the changing table. When we got back from church and lunch today, I got started on the sleepy lion that is over the crib. I have some crazy monkeys in the corner and a huge giraffe left to work on. My nesting instinct makes me want to get in there and keep painting, but my feet and knees have convinced me to relax instead. I have 9 weeks to finish! Daddy is video recording the process, so you may see a video soon. 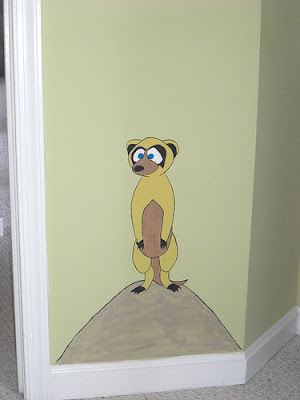 As promised, here is the video of the nursery wall animals painting project. This is day one progress. I'll get more "in action" shots as the project progresses. The video quality sux. I had to re-encode the video after some editing. Each re-encoding degrades the quality of your video.